According to a report published by Bloomberg, Microsoft has just signed a contract with the US Army worth approx $480m. The contract is for the supply of augmented reality system prototypes, and could lead to the military purchasing over 100,000 HoloLens AR headsets as part of its Integrated Visual Augmentation System, or IVAS, program. Only about 50,000 HoloLens units have been sold so far worldwide, according to a recent Microsoft video, a fact that underlines the huge size of this contract. 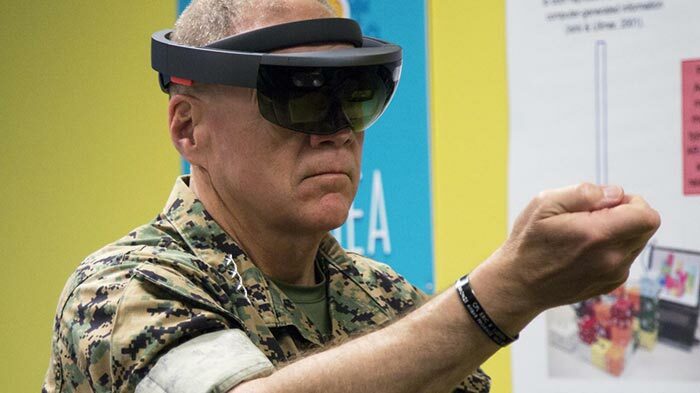 The US Army, and Israeli military, have already used the Microsoft HoloLens hardware in training but this large contract has now been announced as it foresees usage in live combat situations. Yes, this purchase isn't for training, simulations, or support operations like repairs, engineering and field medics but intended to "increase lethality by enhancing the ability to detect, decide and engage before the enemy." A Microsoft spokesman shared some more situational application information with Bloomberg. "Augmented reality technology will provide troops with more and better information to make decisions," explained Microsoft. "This new work extends our longstanding, trusted relationship with the Department of Defense to this new area". Interestingly the US Army isn't going to be taking delivery of standard off-the-shelf HoloLens units. In its public tender the force asked for the following additional features to be implemented by the contract's winning bidder; night vision and thermal sensing ability, soldier vital signs monitoring capabilities, plus hearing protection. Military and policing contracts can be thorny for tech companies to deal with. Previously, workers at the likes of Google and Amazon have pushed back against their software / hardware developments being used for 'policing' purposes such as customs and immigration checks. Some Microsoft employees made their opposition to this US Army contract known via a blog post last month, asking the company not to use its tech to advance the waging of war. In response Microsoft's President and Chief Legal Officer, Brad Smith, wrote about possibly relocating various employees with ethical qualms over some projects. Microsoft will reportedly release a new, improved, yet cheaper, HoloLens for consumers early next year. Image shows headset with interpupillary distance slider, inside-out tracking cameras. AR-Clippy: It looks like you're trying to blow up some unarmed civililians. Would you like some help with that? I used to use the dog with the cape. He's dead now. Depleted uranium toxicity due to too much A-10 CAS.